March 9, 2016, 1:11 p.m.
By Alberto Cairo March 9, 2016, 1:11 p.m.
It’s not just about visualization — it’s also about the critical thinking and analytical mindset necessary before you launch that graphics app. Here’s an excerpt from the book’s introduction; you can download the entire introduction here. It’s a fact of life that kids put their parents to the test with their boundless and unpredictable curiosity. I have three small children, ages 4, 8, and 10. Here are some of the questions that I got from them while writing these lines, followed by my thoughts and the actual answers I gave them. My daughter’s question forced me to take my fingers off the keyboard and think for a minute. My memory of Newtonian physics was a bit rusty, but I was sure that the fact that planets keep rotating is related to the laws of motion. I dusted a couple of popular science books from my shelves and also looked for some articles on the Internet. Then I grabbed a pencil, a pen, and some crayons: I think more clearly when I draw. I ended up with a series of sketches that I’m going to call an “infographic,” a graphical display intended to convey information. Here’s the story I told my daughter. It is obvious that the ball will not move forever. Eventually, it will stop. Why? 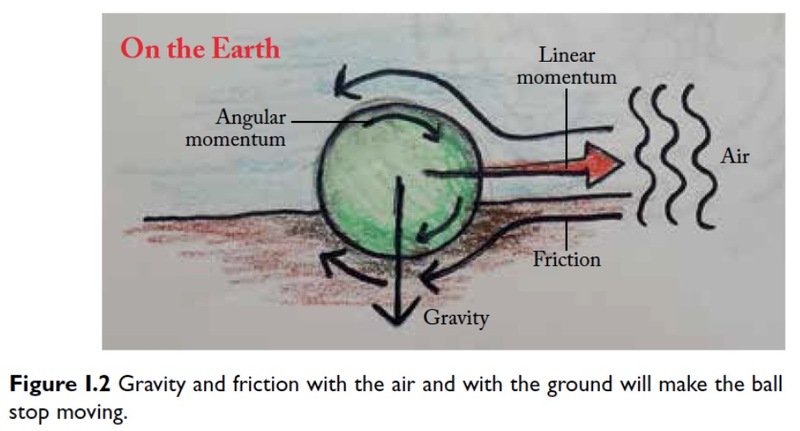 First of all, the ground, as well as the air, provides friction (Figure I.2). Air is a fluid, like water. Imagine that you jump into a swimming pool. When you enter the water, your speed decreases, right? That’s friction at work. Friction is a word we use to describe an interesting phenomenon: the air and the ground absorb the momentum that the ball carries. Now, imagine that you’re an astronaut floating in deep space (Figure I.3). (My daughter pointed out that this illustration is inaccurate; the person in it should be wearing a spacesuit! Extra credit for her.) There’s no air in space. Therefore, there’s almost no friction. 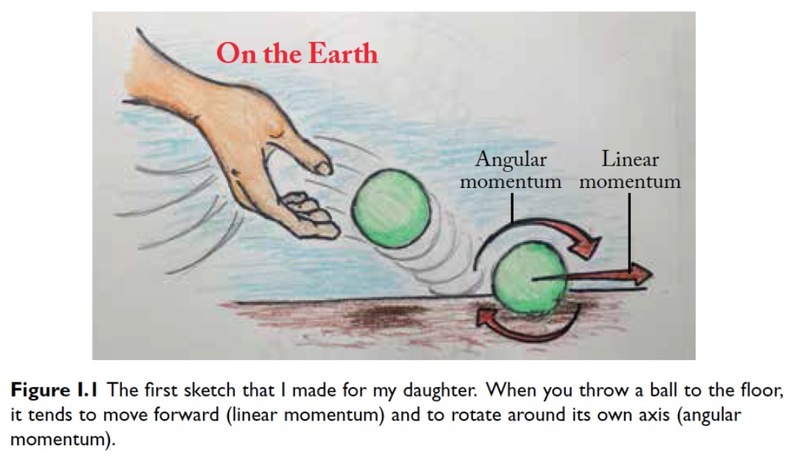 If we throw our imaginary green ball, it is likely that it will take millions and millions of years to stop moving forward. It won’t stop spinning until then either. 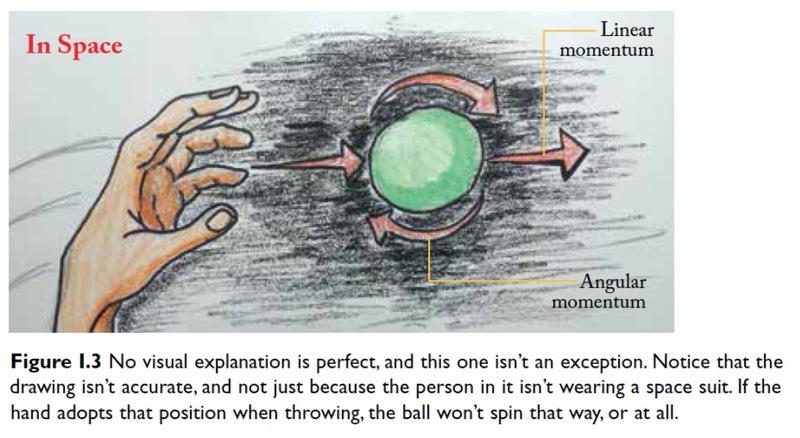 We call this conservation of momentum: if there’s nothing to interfere with the ball, it won’t stop moving. Next, let’s go back in time zillions of years, to the era when none of the planets in the solar system existed. Just the sun was there, surrounded by large clouds of dust particles. These clouds spun at a very, veeeery slow speed. The particles were held together and bound to the sun by gravity (Figure I.4). Something interesting happened then: little by little, gravity made these little particles move closer and closer to each other. And the closer they were, the faster they spun. The reason why that happened is a bit complicated to explain, but it isn’t crucial for now, so let’s leave it for another day. The last step is the easiest to understand. The particles in the clouds moved so close to each other that they ended up merging. 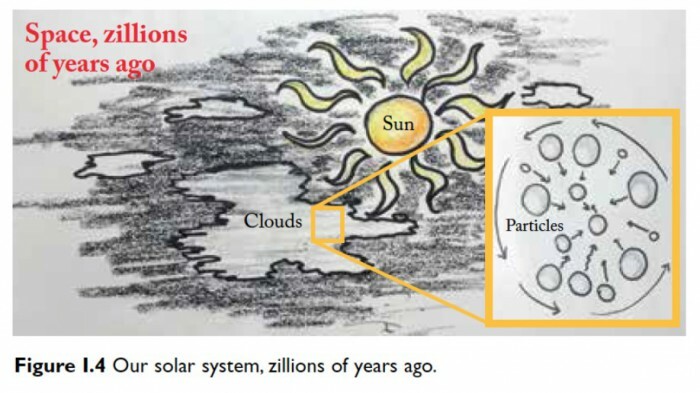 Earth and the other planets were born from collapsing dust clouds (Figure I.5), and they keep spinning, at least for now, because there’s very little in space to stop them from doing so. When you design a graphic to explain something, getting the information right comes first. No good infographic or data visualization — we’ll learn the difference between the two soon — can be based on deficient data and analysis. The quality of your graphics depends fundamentally on the quality of your reporting or research, not just on how good a graphic designer you are. Being concise and clear doesn’t imply oversimplifying. Any act of communication involves a controlled reduction of complexity, up to the point when reducing matters further would hurt the integrity of the information. I adapted the message to my audience by getting rid of jargon and equations, but I respected the essence of the facts and my daughter’s intelligence. Good design isn’t about embellishment but about structuring information to enable understanding. That said, aesthetic appeal is a worthy goal, as it can help make our messages more attractive and, as a consequence, more effective. Graphics that encode information function as cognitive aids. If I had described the process using just words, it’s likely that you’d feel compelled to mentally visualize little balls and arrows. My drawings are intended to do that work for your brain. If words are sometimes useless by themselves, so are charts, maps, diagrams, and illustrations. It is in the combination of words (spoken or written) and visuals that the magic of understanding often happens. Quite good for such a simple exercise, right? And there’s more. All scientific knowledge that we have of this world, or will ever have, is as an island in the sea of mystery. We live in our partial knowledge as the Dutch live on polders claimed from the sea. We dike and fill. We dredge up soil from the bed of mystery and build ourselves room to grow. 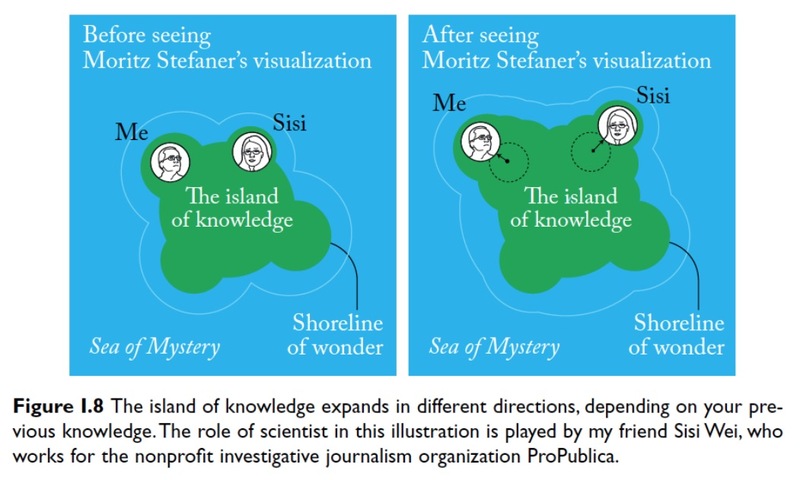 Of course, being a visualization designer, I couldn’t resist making a little illustration of what happened inside my daughter’s brain (Figure I.6): the island of knowledge expanded for her, but so did the shoreline of wonder, draining new land out of the sea of mystery. Finding the right answers to good questions makes us capable of posing even better and more profound ones. We can all enjoy this process. If you allow me a brief digression, this is the reason why I believe that we should teach our kids to love not knowledge per se, but learning. They should be encouraged to cherish the very quests they undertake, not just their products. Good data visualizations and explanation infographics communicate information and, as a result, they can increase our understanding. That’s their first role, and it’s what I was focusing on when I made the drawings for my daughter. Data visualization can help us both to understand complex issues a bit better, but also to provide images to debate about, to refer back to, and sometimes just to meditate over… I want [people] to use the visualizations I provide as starting points for their own explorations… Consequently, any serious visualization of a sufficiently complex topic should always aim at exposing the complexity, the inner contradictions, the manifold nature of the underlying phenomenon. I like to provide users with a structured way to explore a complex phenomenon on their own terms, in a sensually rich mosaic of media and facts rather than a pre-digested narrative with a surprise at the end. To me, interesting topics rarely boil down to a single story. Stefaner doesn’t reject traditional linear narrative techniques outright, but he prefers to build interactive displays that enable discovery. His work embodies this approach. In 2009, he partnered up with the Bergstrom lab in the biology department at the University of Washington to create Eigenfactor, a project that visualizes citation patterns between scientific journals. Some of those visualizations are illuminating. Take a look at Figure I.7 (on the previous pages). What do you notice? 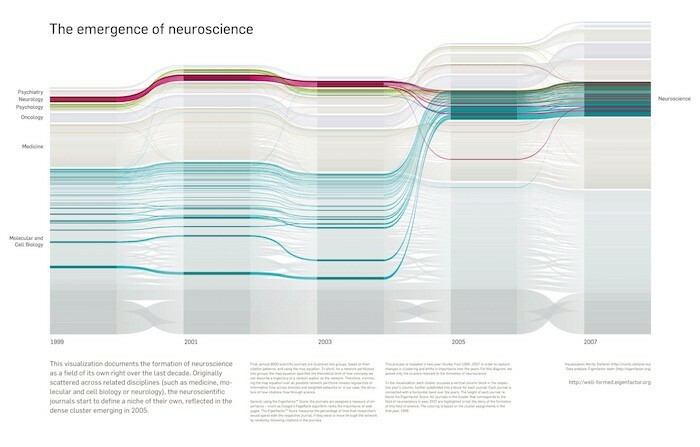 To me, besides the striking beauty of this Sankey diagram, its central message is clear: modern neuroscience is the result of the confluence of several disciplines. That’s the main story I extract. Yours can be different than mine. What you’ll get from this graphic depends on the knowledge that you had before facing it. As a journalist, I can be standing on a different place on the shoreline of wonder than a scientist. Stefaner’s visualization may expand the shoreline in slightly different directions for each of us (Figure I.8) and, therefore, it will lead us to stare at two increasingly disparate patches of the horizon above the sea of mystery. A few weeks ago, I stumbled upon a graphic designed by data scientist Gilad Lotan (Figure I.9) that further illustrates how the communication and exploration dimensions of visualization design complement each other. In an article published in the Los Angeles Times and on the website Medium.com, Lotan described a particularly quirky experiment. In the past few years, services that promise to increase your standing on social media are thriving. For a few bucks, you can be followed by thousands of fake Twitter accounts. Lotan wanted to answer two questions: first, does buying fake followers lead to more real followers? And second, how are fake followers connected to accounts created by actual people? The short answer to the first question is yes. To understand why, you should read Lotan’s article. The answer to the second question is in the visualization that Lotan designed with the data he collected. The multi-colored blob on top represents his 2,600 followers before the experiment. 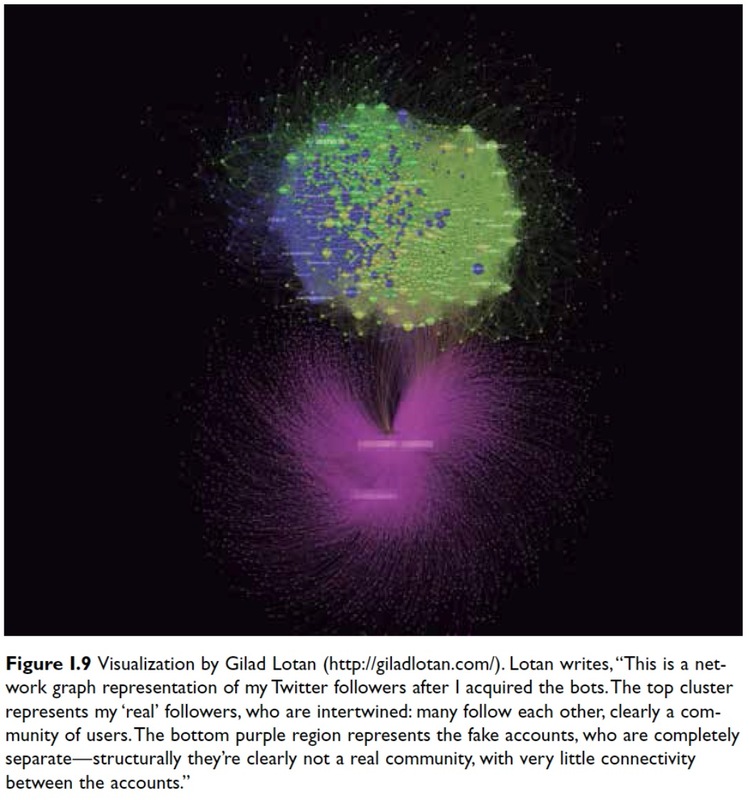 Being part of a virtual community, the nodes are strongly connected and close to each other. The purple cloud at the bottom corresponds to the 4,000 faux followers Lotan paid for. Notice how scattered and sparsely linked they are. No community exists here. 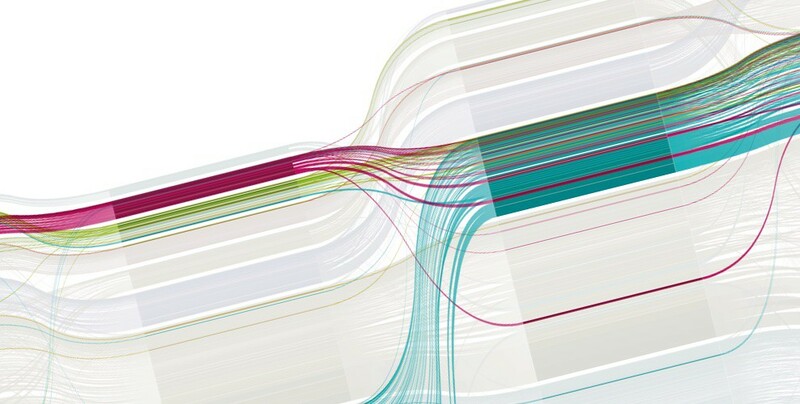 This is the main message revealed by transforming thousands of data points into a visual shape. Many more insights could hide in this intricate display, though. To discover them, we’d need to scrutinize it attentively. Again, communication and exploration go hand in hand. We can tell stories with graphics, but we can also let people build their own stories with them. and presented in an attractive manner, but always remembering that honesty, clarity, and depth come first. This, in a nutshell, is what half of this book is about. The other half is about what precedes design. There are obstacles that hinder the expansion of the island of knowledge. It’s not possible to become a professional visualization designer without learning how to overcome them. Alberto Cairo is Knight Chair in Visual Journalism in the School of Communication at the University of Miami. POSTED March 9, 2016, 1:11 p.m.
Cairo, Alberto. "The island of knowledge and the shoreline of wonder: Using data visualization to prompt exploration." Nieman Journalism Lab. Nieman Foundation for Journalism at Harvard, 9 Mar. 2016. Web. 20 Apr. 2019. Cairo, Alberto. "The island of knowledge and the shoreline of wonder: Using data visualization to prompt exploration." Nieman Journalism Lab. Last modified March 9, 2016. Accessed April 20, 2019. https://www.niemanlab.org/2016/03/the-island-of-knowledge-and-the-shoreline-of-wonder-using-data-visualization-to-prompt-exploration/.